Attention Active K Club Members and all UK Varsity Letter Winners! 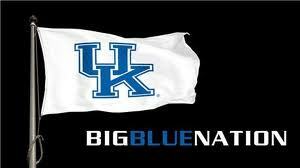 Thank you to all K Club members and UK Varsity Letter Winners on your interest in purchasing UK Football Season Tickets. The UK Athletics Ticket Office and the K Club Ticket Committee collaborated to develop the policies and guidelines regarding the exclusive benefits of UK Football Season Tickets available only for UK Varsity Letter Winners of all sports, which were implemented with the start of the 2015 football season. In addition to being outlined below, these policies and guidelines can also be found at the UK Athletics Ticket Office website, UKathletics.com/tickets. Over 500 UK Varsity Letter Winners of various sports purchased football season tickets throughout Kroger Field in 2018, with over half of those sitting in the designated K Club seating areas. Since the Kroger Field (formerly Commonwealth Stadium) renovations were completed with major changes to the seating arrangements, UK Athletics and K Club have been trying to educate all UK Varsity Letter Winners of the new policies and guidelines for seating options and season ticket discounts/credits available exclusively for them. The K Club has enjoyed the great privilege of having a dedicated seating area for its members since Commonwealth Stadium was built in 1973. And with the recent 2015 renovations, our designated K Club seating areas have grown from 465 seats to nearly 1,000 seats in our new Sections 101 and 102 (Premium Sections under the Overhang) and to the upper portion (Rows 36 or higher) of Sections 1 and 2. Both of which are located on the northeast side of the stadium nearest the K House. Knowing that many UK Varsity Letter Winners are unaware of the seating options and exclusive benefits available to them, we felt the need to bring understanding for letter winners whether sitting in or outside of K Club sections. UK Athletics and the K Club will be strictly enforcing all these policies & guidelines going forward. If you have any questions after reviewing these policies and guidelines, please feel free to contact the UK Athletics Ticket Office at (800) 928-2287 (Option 4) or the K Club at (859) 379-3200 ext. 700. All University of Kentucky Varsity Letter Winners must maintain an “Active” membership status in the K Club (University of Kentucky Varsity Letter Association) to be eligible for exclusive football season ticket benefits and discounts. This requires that you have paid your Annual Membership Dues ($60.00), payable to the K Club, or you maintain a “Life Member” status. Membership status must be current prior to purchasing or renewing season tickets. All men and women who earned Varsity Letters from the one of the 22 varsity sports at the University of Kentucky, as well as varsity cheerleaders, team managers, athletic trainers, and special honored inductees, are eligible for this exclusive membership. IMPORTANT NOTE: Regardless of where anyone purchases season tickets within Kroger Field, all UK Varsity Letter Winners must be an “active” member of the K Club in order to receive any discounts/credits for season tickets. To sign up for K Club membership, please click on this link for Membership Signup. Please note that K Club membership follows the calendar year period, January 1 through December 31. UK Varsity Letter Winners who wish to purchase football season tickets have several seating options available to them that offer discounts/credits, which will vary depending on the sport lettered and whether you sit inside or outside the K Club sections. So when choosing seats in Kroger Field, you will fall under one of four categories: (1) Football Letter Winners (Sitting in K Club Sections); (2) Football Letter Winners (Sitting Outside K Club Sections); (3) Other Varsity Sports Letter Winners (Sitting in K Club Sections); and (4) Other Varsity Sports Letter Winners (Sitting Outside K Club Sections). Are eligible for one (1) ticket to be COMPLIMENTARY, with the other tickets priced at full face value ($365 per seat). May purchase up to two (2) seats in K Club Sections 101-102 and up to 12 seats in K Club Sections 1-2 (Rows 36+), based on availability. K Fund per-seat donations are waived, but K Club Varsity Letter Association does require a per-seat “privilege fee” (see below for applicable fees). EXAMPLE: Football letter winner is selects two season tickets in Section 101 (designated K-Club area). One ticket will be complimentary; the second ticket will be $365. Letter Winner will owe $200 per-seat privilege fees to the K Club on both tickets ($400 total). If choosing seats in an area that requires a K Fund per-seat donation, you will receive up to a $100 credit per-seat on a maximum of two (2) seats. The K Fund per-seat donation credit does not apply in premium seating areas (suites, loge boxes & club seating). Football letter winners that have season tickets in the K-Club Varsity Letter Association sections are not eligible to also receive letter winner discounts/credits for additional seats elsewhere in the stadium. EXAMPLE: Football Letter Winner selects three season tickets in Section 9 (outside of K-Club area). One ticket will be complimentary; the additional tickets will be $365 each. Section 9 seats require a $225 per-seat donation to the UK Athletics K Fund Letter Winner is eligible for a $100 credit toward this donation on first two seats. Thus, the total UK Athletics K Fund donation due is $475. EXAMPLE: Football Letter Winner is assigned two season tickets in the top of Section 1 (designated K-Club area), and ALSO selects four season tickets in Section 23. One of the Section 1 tickets will be complimentary; the second ticket will be $365. Letter Winner will owe $75 per-seat privilege fees to the K Club on both tickets in Section 1 ($150 total). The four tickets in Section 23 will be $365 each. Section 23 seats require a $300 per-seat donation to the UK Athletics K Fund ($1200 total). The $100 credit is not applied because letter winner has already received discounts/credits for their seats in Section 1. Are eligible for a 20% discount per seat ($292 per seat) on the first two (2) tickets, with any additional tickets priced at full face value ($365 per seat). K Fund per-seat donations are waived, but K Club Varsity Letter Association does require a per-seat “privilege fee” (see below). EXAMPLE: Baseball Letter Winner is assigned two season tickets in Section 102 (designated K-Club area). Both tickets will be priced at $292 each (20% discount applied to $365 face value). EXAMPLE: Volleyball Letter Winner is purchasing four season tickets in Section 2 (designated K-Club area). First two tickets will be priced at $292 each (20% discount applied to $365 face value); the additional tickets will be $365 each. Letter Winner will owe $75 per-seat privilege fees to the K Club on all four tickets ($300 total). For any non-football letter winners to receive any benefits, tickets must be purchased inside the K Club sections (Section 101-102, Section 1-2 Rows 36+). Any tickets purchased outside of the K Club sections would be priced at full face value and would not be eligible for any discounts. EXAMPLE: Soccer Letter Winner selects two season tickets in Section 21 (outside of K-Club area). Both tickets will be priced at $365 each. The 20% discount does not apply to seats outside of the K-Club seating areas. Section 21 seats require a $100 per-seat donation to the UK Athletics K Fund ($200 total). REMINDER: Actual costs for season tickets (including any K Fund donations) are payable directly to the UK Ticket Office, whether you purchase tickets inside or outside of designated K Club seating areas. Season ticket costs can be paid through your online My UK Account at UKathletics.com/renew or by calling (800) 928-2287 (Option 4). UK Ticket Office will mail paper invoices directly to all UK Varsity Letter Winner season ticket holders toward the end of February. RENEWALS: Season tickets are able to be renewed online each year through your My UK Account at UKathletics.com/renew. Alternatively, you may return the paper renewal invoice mailed to you. Please note that a $16 renewal processing fee applies to all accounts, regardless of how many season tickets you receive. If you have questions about your renewal or are unsure of your My UK Account log-in information, please call the UK Ticket Office at (800) 928-2287 (Option 4). NEW PURCHASES: If you currently do not have season tickets and you are interested in purchasing season tickets in the designated K Club sections, please for the 2019 football season, please email your request to the K Club Ticket Committee at ticketcommittee@kentuckykclub.com or call the UK Ticket Office at (800) 928-2287 (Option 4) and designate yourself as a K Club Varsity Letter Association member. For verification, you will need to provide the sport, year lettered, and proof of payment for membership in the K Club. Existing season ticket holders that wish to upgrade their seats OUTSIDE of the K Club Varsity Letter Association seating areas (Sections 101-102 and Sections 1-2 Rows 36+), must opt-in to the annual seat upgrade process with the UK Ticket Office as a part of your season ticket renewal. In May, you will be assigned an upgrade appointment time. Unique to K Club Varsity Letter Association members, once you are notified that your upgrade appointment window opens, you must call the UK Ticket Office at (800) 928-2287 (Option 4) to discuss seating availability. K Club members are unable to use the Kentucky Football Virtual Venue for the upgrade process as it will not recognize your member discounts. SEASON TICKETS: Payable to the UK Athletics Ticket Office through your online My UK Account at UKathletics.com/renew or by calling (800) 928-2287 (option 4). You may also return the paper renewal invoice mailed to you with a check. Website - You can log into your K Club account at www.kentuckykclub.com and pay for your Membership Dues and UK Football Season Ticket Privilege Fees with a credit card. If you have not logged in to the website and/or do not currently possess a username and password information, then please contact our K Club Executive Director, Chad Burnett, via email or phone. We may have you in our system already, so please reach out and verify with him. 2019 K CLUB ANNUAL MEMBERSHIP DUES (paid to K Club): DUE NOW! What happens when a payment is not received by the due date to the K Club? If you, as a UK Varsity Letter Winner, purchase football season tickets anywhere in the stadium, your eligibility status will be verified again after the renewal deadline. The K Club and the UK Ticket Office will work together after the renewal period to ensure that membership and privilege fees (if applicable) have been paid prior to season tickets being mailed. UK Athletics reserves the right to place a hold on season tickets for delivery until all appropriate payments have been made. Additional monies may be due if you no longer qualify for K Club Varsity Letter Association discounts, due to non-compliance with membership dues or privilege fees. Being a season ticket holder at UK Football games is just one of the many privileges that we, as UK Varsity Letter Winners, have to celebrate our great traditions, to share in fellowship, and to support each other and the current student-athletes at the University of Kentucky. Thank you for your continued support and participation that has been an essential part of the success of the K Club and UK Athletics!!! ’TIL THE BATTLE IS WON!